How do you define a Class Organization? From the very top on down. An organization that, internally, has everyone’s attention and 100% participation. Pride that’s felt everywhere and amongst everyone. Like one big family that cares. That’s the 49ers. The Season is actually 12 months long for the 49ers – as they like to say, “There is no off-season” – both on and off the field. As the on-field football season ends, the Foundation gets to work, hosting charitable events that raise millions of dollars to benefit non-profit organizations in alignment with the 49ers Foundation’s mission to keep kids “Safe, On Track, and In School.” During the season, each week on the players’ day off, the 49ers orchestrate community events that transform people’s lives. 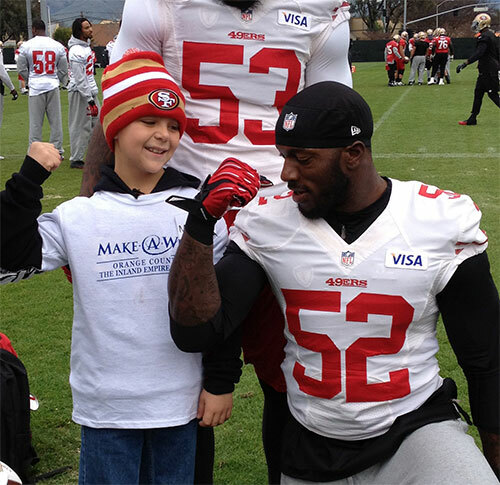 The San Francisco 49ers Foundation is the non-profit community funding extension of the 49ers, now in its 23rd year. The Foundation supports programs for underserved youth that keep them “Safe, On Track and In School.” Over the past 23 years, the Foundation has donated nearly $30.6 million - $4.6 million in 2014, including a $1 million gift to launch the 49ers STEM Leadership Institute in collaboration with the Silicon Valley Education Foundation and the Santa Clara Unified School District with significant support from Chevron. 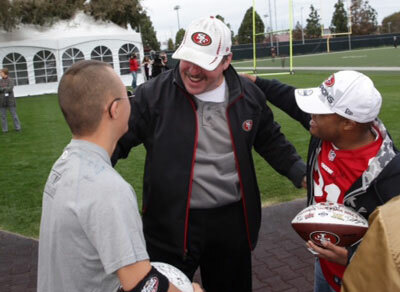 The philanthropic efforts of the 49ers Foundation are highly focused and strategic; remaining true to the well-developed mission statement and purpose and committed to creating measurable results through transformational grants and impact programs. 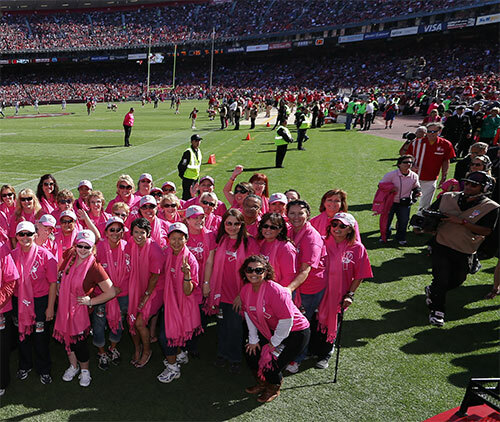 In 2014, 49ers players participated in more than 50 events, donating over 400 hours of volunteer time, impacting over 80,000 people in need annually. In 2014, 100% of the players participated in one-or-more community events. 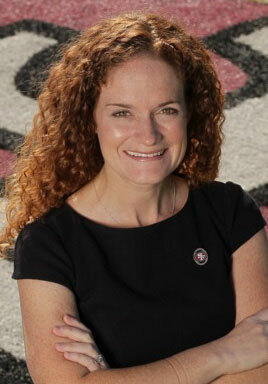 Meet Joanne Pasternack, the Director of Community Relations and the 49ers Foundation for the San Francisco 49ers. Joanne attended high school in the Bay Area. Her father was a dedicated fan of the 49ers and Joanne grew up cheering for the 49ers as well. She went to college at the University of Pennsylvania, then to law school at Santa Clara University. Following law school, she went to ashington, DC, where she worked with the Kennedy and Shriver families for the extraordinary non-profit, Special Olympics. At Special Olympics, she found a perfect marriage of her two passions – sports and philanthropy. It was the beginning of Joanne’s path towards a position that seems tailor-made for her interests and skills. After working a World Winter Games for Special Olympics in Alaska, Joanne returned to the Bay Area where she secured a job with the City of Mountain View in the City Manager’s Office and the Police Department. While there, she co-founded the Mountain View Police Activities League (MVPAL), where she once again found a natural proclivity for event management, charitable outreach and using sports as a vehicle to transform perceptions and, in turn, a community. She was at the City of Mountain View in a variety of roles for over six years when, one day, she saw a job posting. She remembers how her heart began beating with excitement as she read the position description. “Looking for the right person … The San Francisco 49ers … Community Relations.” She couldn’t believe what she was reading. This would be her dream job and she wanted to go for it and boy, did she! Joanne told me about the 49ers and their overall commitment to charitable work. Their concept of Sports and Philanthropy was no afterthought. Leading by example, are John and Denise and Jed York and their entire family. John, Denise and Jed live and breathe philanthropy, vigorously engaging in activities and throwing considerable energy, effort and support towards the team’s charitable endeavors. John and Denise’s daughters, Jenna and Mara, are active participants in nearly every community event, sharing their zeal for transforming the lives of at-risk youth through hands on service. Their brother, Tony, is also involved and spent time with his father in New Orleans, visiting a school that had been ravaged by Hurricane Katrina and taking time to get to know the students, among other activities. Daughter-in-law, Danielle (Jed’s wife), is a former school teacher and worked for years in an underserved middle school deep in the heart of one of the most challenged parts of San Francisco. From the top down, it’s the culture, the fabric, the very spirit. Their desire has always been, and will always be, to see “Philanthropic change through sports.” Indeed, they want to be not just the best in the NFL, but in all sports. In 2013, they achieved this goal and were named the national recipients of the Robert Wood Johnson Foundation’s prestigious Steve Patterson Award for excellence in sports philanthrophy. They were also one of four finalists for the Global Beyond Sport Award for outstanding sports team. The San Francisco 49ers Foundation was honored by the San Jose/Silicon Valley Business Journal for being No. 13 in corporate philanthropic giving in 2014. Not bad for a company that has only 250 employees. The No. 2 Company, by comparison, was Cisco, with 72,000 employees. There are many examples of their contributions. The San Francisco 49ers Academy – a school for low income middle school youth in East Palo Alto – not only bears the name of the 49ers football team, but it is also indelibly stamped with the spirit of their storied franchise. The school focuses on the underlying socioeconomic situations that were barriers to the students’ success by collaborating with teachers, police officers and strong mentors. Recognizing the challenges faced by youth in the economically disadvantaged community of East Palo Alto and seeing an opportunity to make a measurable difference for these youth, the 49ers Foundation has been a part of the Academy since 1996, giving grants while also providing hands on support through collaboration, 1000s of game tickets, mentorship, facility enhancement, and donations. With an increase in obesity rates among our nation’s youth, the 49ers have incorporated the PLAY 60 youth fitness program into the Academy to increase the students’ overall health, building a $75,000 outdoor fitness zone and bringing national visibility to the school and its commitment to fitness through a partnership with Matthew McConaughey. With the 49ers involvement, test scores have skyrocketed to the highest level in the school district – on par with far wealthier ZIP codes. 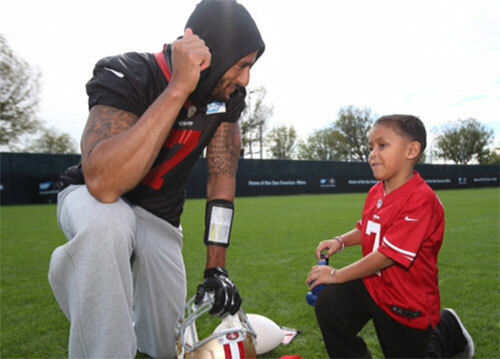 In 2014, the 49ers Foundation facilitated $750K in contributions to the Academy, hosted eight events and dedicated countless volunteer hours to assist the youth. And there is so much more! Breast Cancer Awareness, helping feed the homeless, where Jed has been the Food and Fund Drive Co-Chairman for Second Harvest Food Bank for two years. The Bayview Hunters Point YMCA near Candlestick Park is another place they love supporting. They are also strong supporters of City Year San Jose/Silicon Valley, Hedge Funds Care (eradication of child abuse), the Center for Youth Wellness, Fresh Lifeline for Youth (FLY), and the Football Camp for the Stars (a camp for athletes with Down syndrome), and many others. 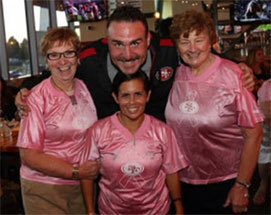 The 49ers Taube/Koret Touchdowns for Kids program is another wonderful example of the giving spirit of the 49ers. For every Touchdown, Field Goal, Interception and Sack, in partnership with the Taube Family Foundation and the Koret Foundation, the 49ers, philanthropist Tad Taube and Koret have raised $1.25 million to help support Bay Area charitable organizations. Again, here is a collaborative commitment that helps improve the life, safety and educational opportunities for the children of the communities they serve. 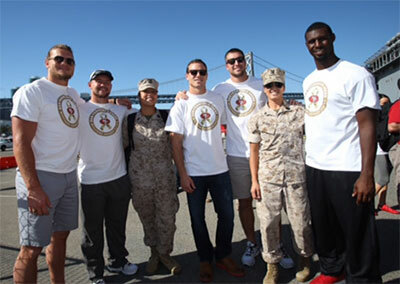 The 49ers host two very popular — and philanthropically productive — fundraising events. One is the Pasta Bowl. This has become their popular annual kick-off to the new season, the night before pre-season training begins. All the players come together and literally serve their designated table of admiring fans with food and pictures and fun. All proceeds go to benefit the community. 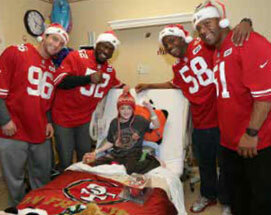 There is also the 49ers Foundation Winter Fest, held in March in Lake Tahoe. This event always sells out. 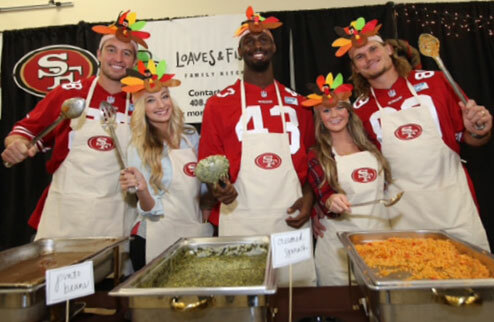 It’s a fun time for all and in 2014, the 49ers Foundation brought in $2 million during the weekend to support local Bay Area charities. That primarily is the Foundation side. There is also the Community Relations side. Each week, the players have one day off. Typically it is on Monday. On their day off, the Community Relations team organizes community events where players have an opportunity to participate in hands-on service events where they can directly impact those in need in the Bay Area. From hosting a board game tournament for youth with serious illness at the Ronald McDonald House to building a playground in East Palo Alto, inspiring incarcerated youth to choose a different and more productive path and so very much more, for the 49ers philanthropic outreach efforts, it is always about the people and for those in need in our community. There are a good number of players who can relate to coming from hard upbringings and they pour their hearts into the events. FLY is a perfect example, where the players and students talk about issues and goals. The players inspire and make a difference for the kids they personally reach through such community visits. Even on the road, like when they have traveled to Youngstown to train in between East Coast games, they made a huge difference visiting a local hospital, school, and community center. In October 2010 and 2013, when they traveled to London to play in the NFL International Series game, they had one day off. Instead of site-seeing, they arranged special days with a hugely popular Premier League team – Tottenham Hotspur – and together, in one of the poorer districts of London, they held a collaborative event for 100 low-income youth showcasing the PLAY 60 movement and the importance of getting out to play, 60 minutes a day, through both football and soccer. It was an amazing day. The 49ers were the first to host such a large scale event while playing the International Series game. The following year, another team repeated this warm, monumental gesture. The 49ers are also very active in spreading the messaging of the NFL “Play 60” Campaign to inspire children to be active and keep healthy. 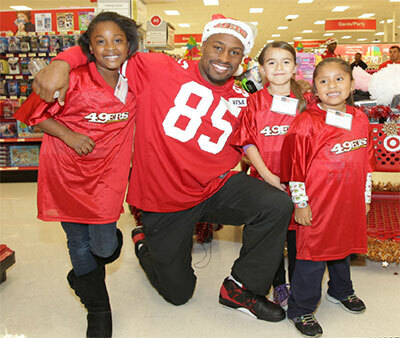 Vernon Davis has been a 49ers spokesperson. 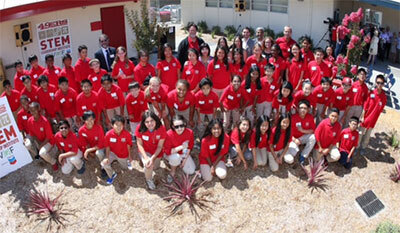 One year, inspired by the youth’s commitment to the campaign, he hosted a team of 15 students from the 49ers Academy who participated in a competition to write a commercial for “Play 60.” Vernon arranged for a Limo ride to a special evening held at his home with an Academy Awards Red Carpet look, plus Paparazzi and Oscar-like statues for the kids. A fun, memorable event for everyone for a life time! Another example of the tremendous player participation is Joe Staley who, with a librarian for a mother, loves reading to elementary students and was honored with a national accolade for helping build literacy among youth. It does make a difference. And the list of what all the 49ers do, individually, as a Team and as an organization is a very long one. All without fanfare, but with total dedication and passion. Indeed, when I visited with Joanne, there was definitely an energy, a spirit that touched everything and everyone there. It was obvious – all about helping benefit community – and infectiously and fantastically impactful. The 49ers feel that community has done so much to benefit them as an organization and, as a result, the organization in turn is happy and proud to be able to give back to the community - as it has and will continue to in perpetuity. If there were a Super Bowl Trophy given to the organization based on what they do off the field, as well, no doubt the San Francisco 49ers would be winners of that one each and every year.